Confidence among America’s business leaders has improved a lot in recent months. For example, the Business Roundtable’s CEO economic outlook index jumped by 19.1 points to 93.3 in March. 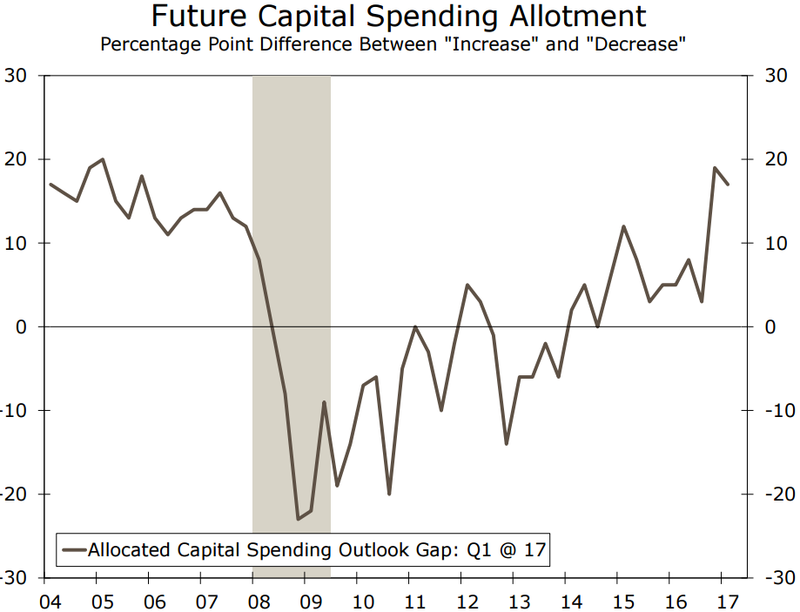 That is the largest increase since 2009 and reflects broad improvements in executives’ expectations for sales, capital spending, and job creation. Smaller business owners have also experienced substantial gains in overall confidence lately, as evidenced by the past few updates to the National Federation of Independent Business’s (NFIB’s) optimism index. 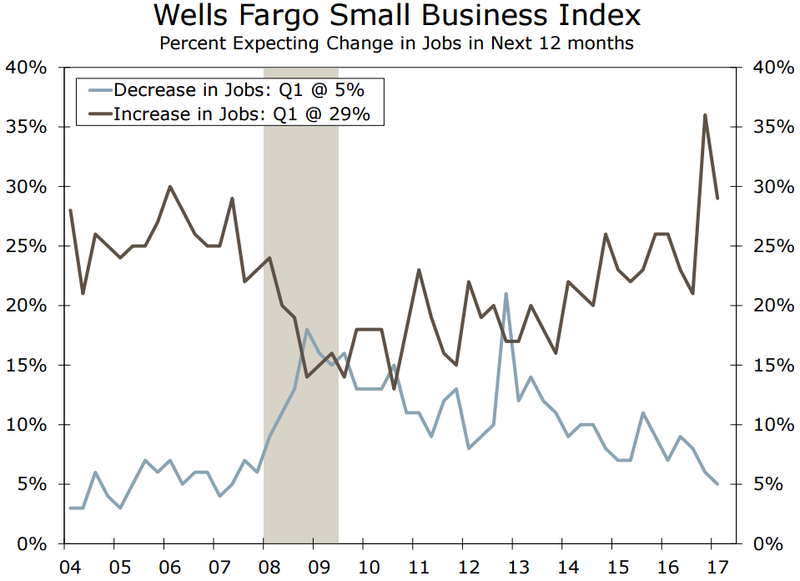 Similarly, a gauge of small business owner sentiment from Wells Fargo and Gallup surged this quarter by 20 points to 100, the largest increase in three years and the highest reading since 2007. All of these surveys saw their confidence gauges spike after President Donald Trump’s election victory because of expectations that the new administration and Congress will together cut taxes, invest in infrastructure, reduce regulations, and adopt other policies that are supportive of business and economic growth in general. However, there are also some encouraging signs that the recent improvement in sentiment is due to more than just renewed hope about the future. 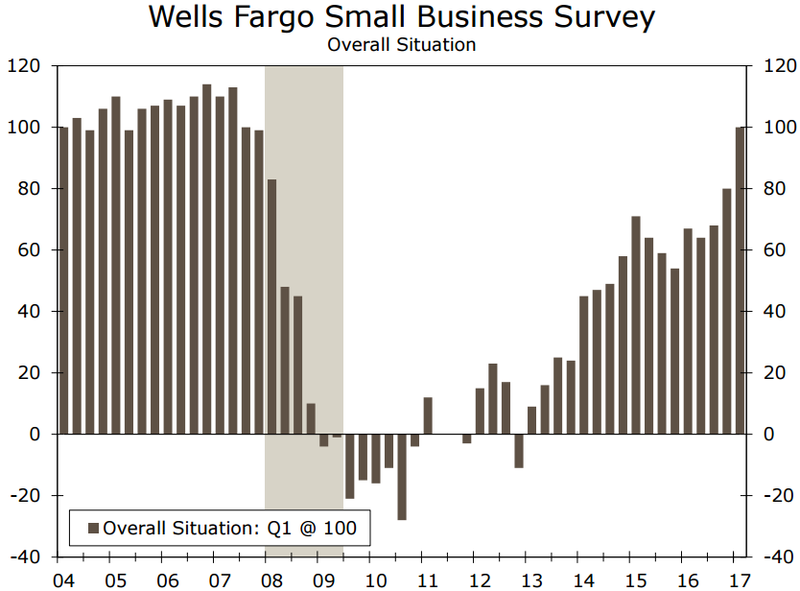 In the Wells Fargo survey, for instance, owners’ overall assessment of the present business situation improved by the most on record this quarter. 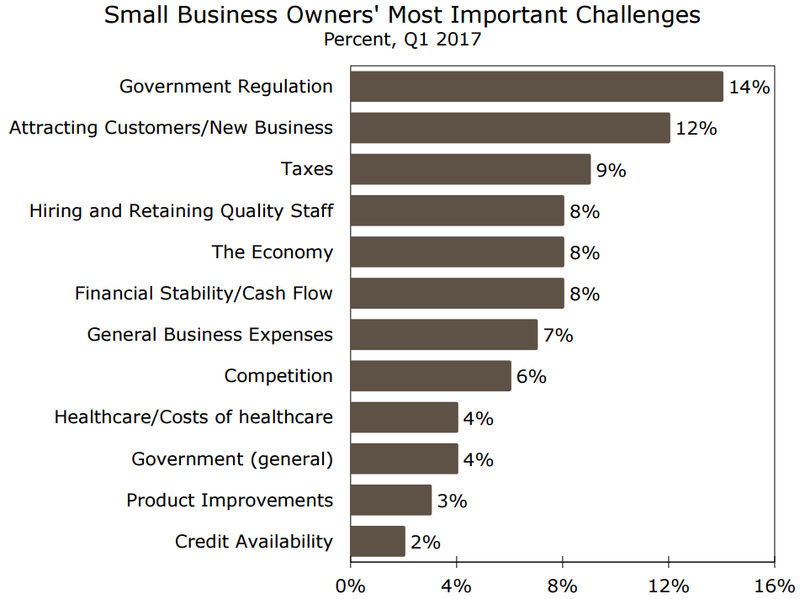 Further, a rising proportion of owners reported that their sales have increased over the past twelve months, and nearly three in four respondents rated their current financial situation as “good.” Challenges remain, though, with burdensome government regulations being the top cited concern for small business owners in the Wells Fargo survey, followed closely by attracting new customers, taxes, and hiring/retaining quality employees.